Since Chaucer and Wycliffe were contemporaries, scholars debate whether Chauer’s “Parson’s Tale” in the Canterbury Tales is a disguised Wycliffite sermon. 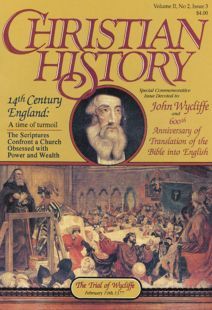 The Parson is introduced in the epic with the words, “I smelle a Lollere in the wynd.” Some feel The Parson is Chaucer’s tribute to Wycliffe. The following is from the Prologue to the Canterbury Tales and is adapted from the original Midland English by Ruth M. Stauffer. A kindly Parson took the journey too. He was a scholar, learned, wise, and true. And rich in holiness though poor in gold. Could be content with little, in God’s way. And taught his flock, and preached what Christ had said. The rich or poor to him were all the same. No wonder that iron rots if gold should rust! You could not find a minister more pure. He lived himself the Golden Rule he taught.